When looking for lodging in or near Cornville, Cottonwood has the closest accommodations to this small rural area. The historic Cottonwood Hotel in Old Town is one of the closest hotels and of unique places to stay. 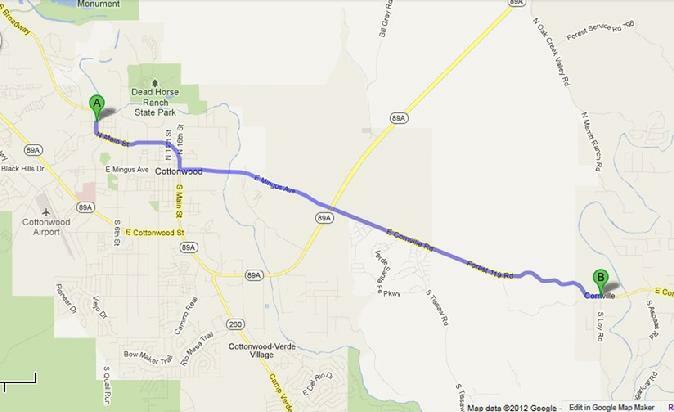 Cornville is located between Sedona and Cottonwood. See Cornville Arizona area map below. If you are traveling with a dog, the Cottonwood Hotel has one (dog) pet-friendly hotel room. 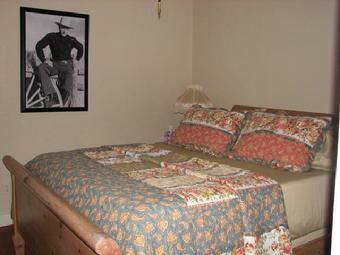 This dog-friendly unit is also available for vacation rental, as it is a well-appointed studio suite and sleeps three. Page Springs Fish Hatchery named after the Page family, previous owners of the property who had been raising trout as far back as the early 1930s. Arizona's Manzanita Inn is a family owned and operated fine dining restaurant that creates German, French, Swiss and Italian specialties. 12/1 - 12/31 - Kessel Cornville Christmas - house and front yard covered with lights that are meticulously choreographed to Christmas music. Everyone is invited to sit in chairs Mr. Dave Kessel arranges in his front yard or you can pull your car up on his lawn. Nightly at 6 and 7 pm. 555 S Gloria Lane, Cornville. Free. Get directions from the Cottonwood Hotel by clicking here.